So far, so familiar – after all, in the last few years meditation has gone from fringe to mainstream. But this is no yoga class full of avid seekers of enlightenment. Instead, it’s a classroom full of lively 10-year-olds in a challenging state school in South East London. You might think it would take a brave teacher to turn to meditation rather than more conventional forms of discipline, but according to Adrian, the impact was immediate. Mr Bethune, when are we going to do meditation again? Adrian’s ‘aha!’ moment came during what he refers to as a ‘Friday moan’: a session at LSBU when all the trainee teachers could come together and share the good – and the not-so-good – experiences from the week. ‘A friend from the course gave me a book called Teaching Happiness and Wellbeing in Schools. I couldn’t put it down. Every single page just made me think ‘this is why I wanted to become a teacher.’ I started incorporating some of the ideas from the book into my teaching, and as the children became happier, I did too. 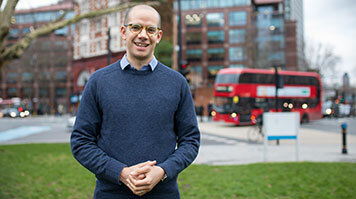 Colleagues could see the difference, and soon Adrian was sharing his ideas with other teachers, initially at his first school in Lewisham and now in his current post at Westfield Primary School in Berkhamsted. He’s also looking to spread the message more widely, combining his work as a classroom teacher with running training sessions for both teachers and pupils under the banner Teachappy – and publishing a book, Wellbeing in the Primary Classroom: A Practical Guide to Teaching Happiness. My long-term goal is to get these ideas about teaching happiness out to as many schools as possible. My aim is to plant some seeds so that these children have simple practical tools to help them lead happier lives. And if they experience difficult times in the future, they’ll know what to do.